The 870/1570 3-D Camera Rig is owned by Iwerks Entertainment in Burbank, Calif. and is shown here as an example of HinesLab design and engineering. The Iwerks 870/1570 3-D rig is rented to the movie industry for shooting 8-perf and 15-perf 70mm film for large-format screens. 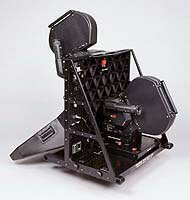 The Iwerks 3-D rig accepts MSM-870 and Iwerks 1570 cameras. The Iwerks rig is protected under HinesLab patents. Cameras attach quickly and securely and do not need shutter modification. A variety of removable front beamsplitter housings are available so that the rig can be compact when needed, or fitted with a larger beamsplitter (shown) to accommodate wide-angle lenses. An internal mechanism allows independent adjustment of the interaxial spacing (to control the amount of depth), and changes in convergence distance (to bring images off the screen). Adjustments can be made during the shot manually, or with a wireless remote control. Convergence settings can be calculated with an available 3-D pocket computer. The 3-D Video Viewfinder, a 3-D video assist, is also available which provides valuable information when shooting 3D. Color monitors show objects floating off the screen, or breaking frame lines. 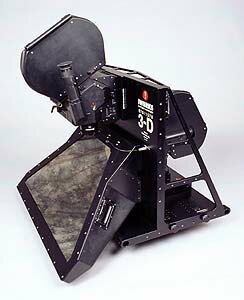 By using the remote control with the 3-D Video Viewfinder, the Iwerks camera rig can be adjusted until the shot works. Interaxial: 0 – 4.5 in. Convergence: inf. – 4 ft. Minimum focal length: 40mm on 8 and 15-perf 65. "The rig has all of the features producers, directors and cinematographers demand when they make LF (large format) films. The Iwerks rig has all of the typical HinesLab finishing touches like a rigid and relatively light-weight structure that provides for fast and easy removal of cameras." Don Marren in Stereo World magazine, January/February 1999. 1999, Jan./Feb., StereoWorld, "Large Format 3-D Films: From Museum to Mainstream", p. 18-20. This is not a product for sale or rent by HinesLab, but is shown as an example of technology, developed by Steve Hines, which clients can now expect from HinesLab on a contract basis.